Thanks to Find a Grave, I learned that Anna was buried in Clinton Cemetery in Clinton, South Carolina. 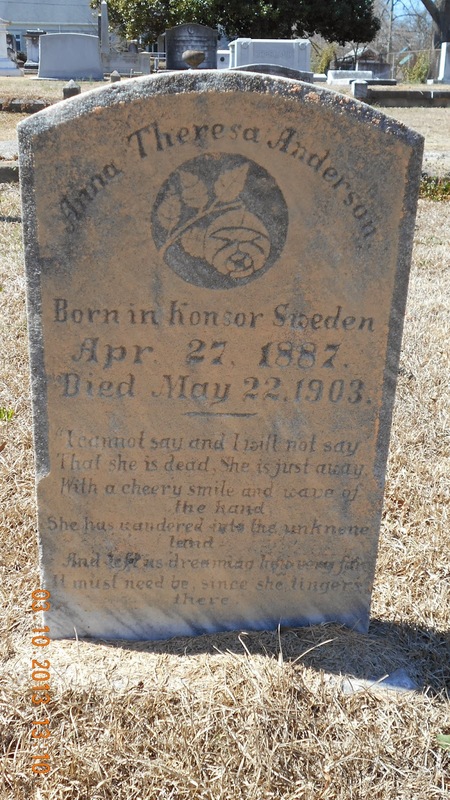 There’s no picture of a headstone*, but the person who created the memorial made a note that the inscription read, “Born in Konsor, Sweden.” From there we have Anna’s birthdate as well, April 27, 1887. The big piece of the puzzle stems from how and when Anna and her sister, listed on the 1900 Census as Hedvig ended up in South Carolina’s Thornwell Orphanage after being born in Sweden. 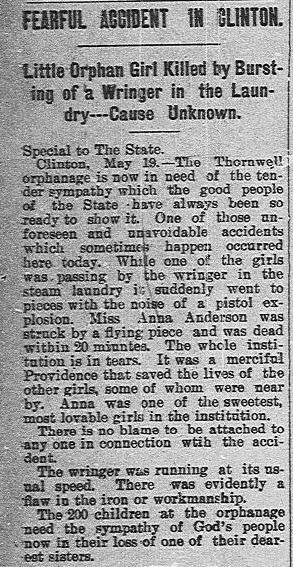 Based on these newspaper clippings, they’d been pupils at the orphanage for “a number of years”, so there are still many unanswered questions about Anna’s early life. Anna was well-liked by the other children in the orphanage and apparently a talented musician, playing the organ in the Presbyterian-affiliated institution’s chapel services. Mrs. Cyrus McCormick, mentioned in one of the articles, was Nettie Fowler McCormick. Her husband was the inventor of the horse-drawn reaper and built his fortune with the McCormick Harvesting Machine Company. One of Nettie’s philanthropic endeavors was supporting the Thornwell Orphanage, explaining the link between the wealthy Chicago woman and the Swedish-born orphan. With musical talent and a connection to a prominent woman, Anna could have gone on to become a great musician, or at least found a way to get past the hurdle of orphanage life. I submitted a photo request through Find a Grave when I originally wrote this post and today one of the volunteers added her headstone.